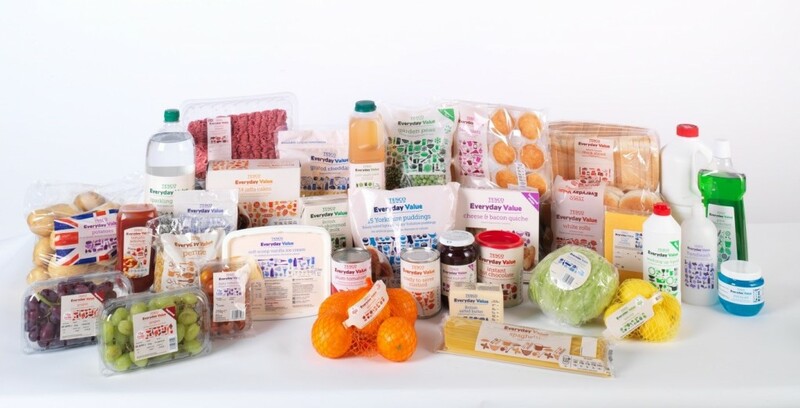 Whether it be primary, secondary or transit packaging, there are some top tips that help businesses better market their products and strengthen their brand. One industry that is very good at this, is the food packaging industry. Food packaging is vitally important: not only does it protect food during transportation, but it also helps sell the food. You can have the same two products in two different packages, and if one looks much nicer it is much more likely to sell more. Food packaging can also help to encourage repeat business, making it easy for customers to find and select your product in a shop. Though take note, it might also deter potential buyers if they don’t feel it’s genuine. 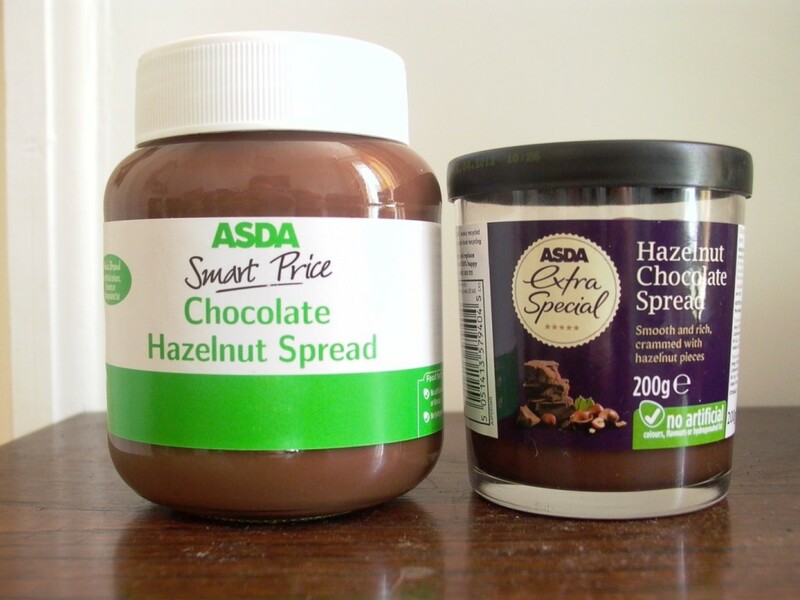 This excellent food packaging comparison shows the reality of misleading food packaging, where in many cases the food product looks nothing like what the packaging suggests. The key to good food packaging is a marriage of several elements such as practicality, attractiveness to customers and the ability to protect the food, amongst others. 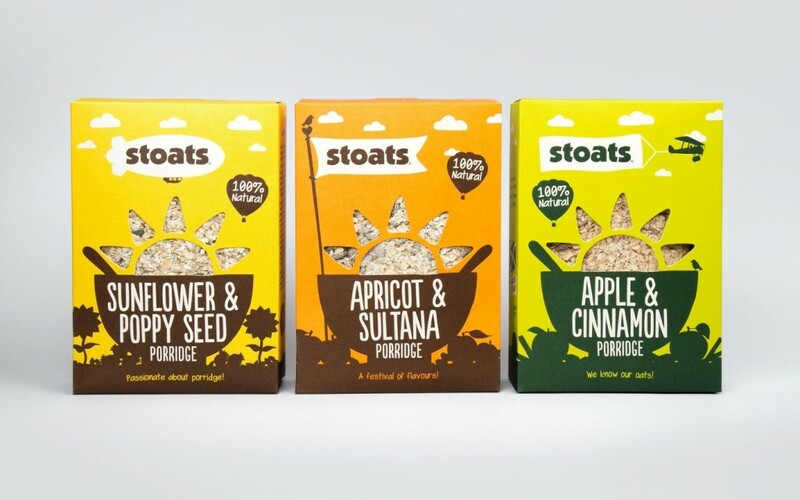 These designs for Stoats by Leeds based Robot Food feature a window through which the porridge oats can actually be seen. Using a window like this gives the customer an accurate depiction of what the product looks like before they buy; the appearance of the product is actually a factor in the decision to buy the product. If the customer is persuaded by the appearance of the food, they are less likely to be disappointed when the packaging is finally opened. “For any brand with a limited marketing budget, it’s necessary for the packaging to tell the brand story and promote the product. This was the case for Stoats. Retaining enough from the previous design to make it easy for brand loyalists to understand, we injected a whole load of fun in a way that was true to the Stoats story. The new designs are eclectic, colourful and inviting to all ages. The naive illustration style feels homemade, almost as if the designs were created by the team at Stoats. 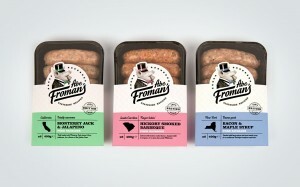 The packaging has interest and brand tone of voice all over to keep you entertained while eating your breakfast. This method of showing the food is recommended for organic products and other high quality luxury foods. 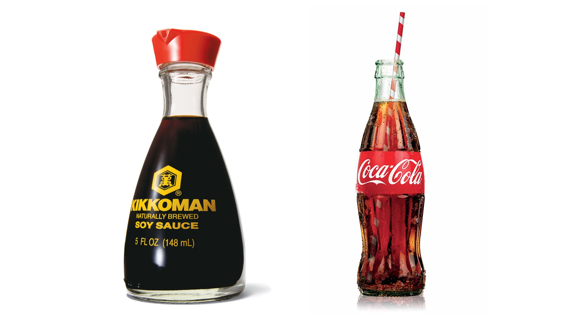 Famous packages like the Kikkoman Soy Sauce bottle (designed by Kenji Ekuan) and the Coca-Cola bottle (created by Earl R. Dean) are not only iconic designs, but also collectors’ items within their own right. 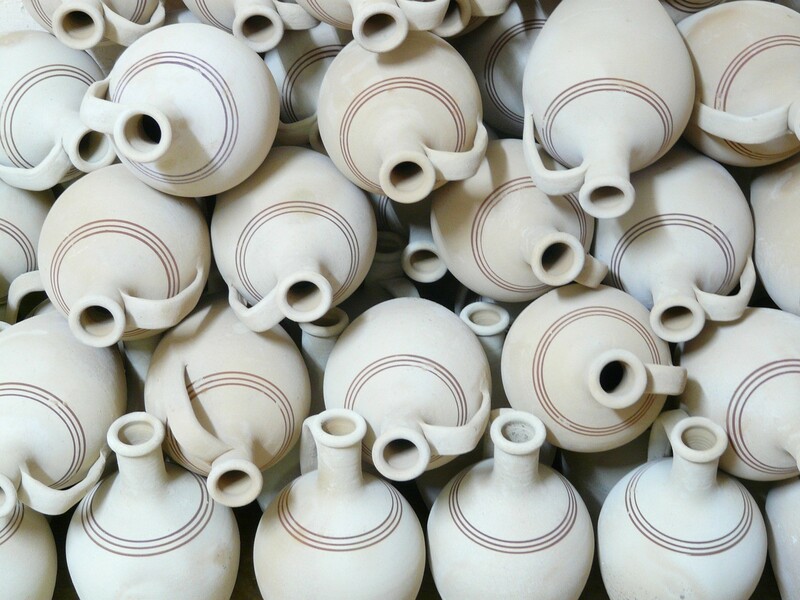 Both of these designs are often used as small vases for flowers, and the multi-use properties of packaging such as these will often influence a purchase/encourage a sale? Other industries that could adopt this approach include perfumers and shoe makers. ‘Value’ product packaging design may not be that obviously exciting, but it is undeniably clear in its communication of what’s inside the package. The Tesco Everyday packaging by Rocket Design is clear, concise and effective: a customer quickly knows exactly what they are getting. 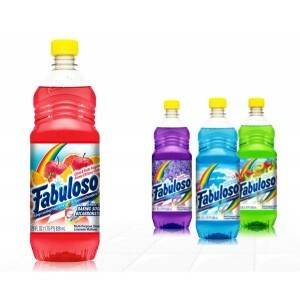 Some designs are not so clear, such as this infamous Fabuloso bottle: is it a fruit juice drink or a cleaning product? Answer: It’s a cleaning product. 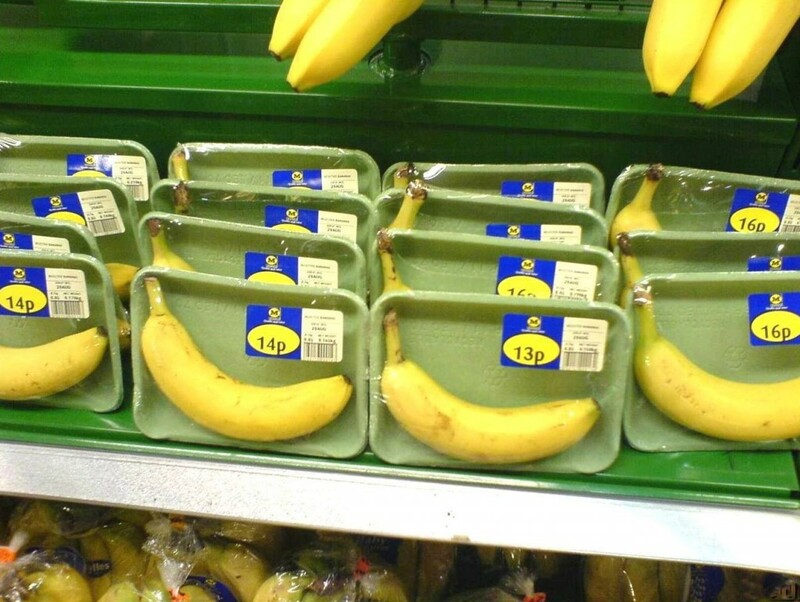 This packaging for bananas in Morrisons went viral – and for good reason too. They really didn’t need to be wrapped in so much plastic and the environmental impact of so much packaging could be enormous in the long run. Are all of the parts of the packaging necessary? Are there any more environmentally responsible alternatives? Can the packaging be reused in any way? Can all of the packaging be recycled? Can some parts of the packaging be recycled and not others? If so, can these parts be separated easily? For food packaging to be most effective, there should be a perfect marriage between aesthetics and use. An interesting looking package may be enough to tempt a customer into an initial purchase, but it’s the functionality that will keep them coming back. 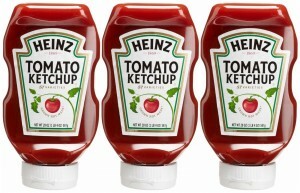 A great example of this is Heinz Ketchup bottles; according to ‘The Marketing Blog’, customers consumed 78% more ketchup after the bottle changed size and turned upside down. One of the key features of packaging is its ability to be transported. 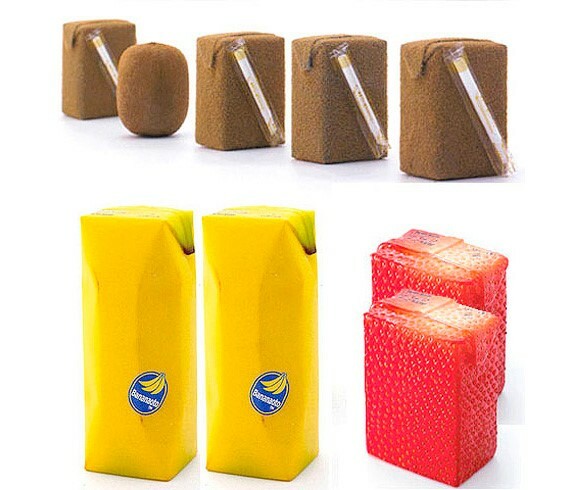 If you cannot transport your product easily and effectively without the packaging being damaged, then you cannot expect to sell many products successfully. Nothing packs together as easily as a box, but boxes do not always make the most interesting package designs, so if you’re going to use experimental packaging make sure that the way it will be transported is practical and cost-effective. The Toblerone chocolate bar box was designed to resemble a Swiss mountain range, but is also easily transported and stacked by turning some bars upside down and interlocking them. A customer’s first impression of your product is usually based on the packaging as it is the first thing they see, and that impression could dictate whether they become repeat customers or even brand advocates. Ensuring that your packaging is both fit for purpose and effectively designed will encourage repeat sales. Effective packaging delivers the brand message, builds lasting relationships and gives the customer insight into the contents and quality of the product. Because the food industry is so competitive, brands have to stand out, whether that is conveyed by the design of their packaging or by showing the quality of the contents inside. This entry was posted in Packaging Industry News and tagged delivery, design, packaging, packaging innovations, rajapack on July 31, 2015 by Rajapack. Packaging tape comes in many different varieties, ranging from industrial tape which secures heavy duty items, to custom printed tape which strengthens brand and design messages, and low-tack tape applied to windows for the building trade. At Rajapack, we feel that it’s one of the most versatile products on the market. Packaging tape is not usually the first material people think of when they think of craft materials, but it’s extremely versatile and can be used in many types of project in order to customise an item or strengthen the structure. To discover some of the lesser known creative uses of packaging tape, we sat down with two talented craft bloggers: The Crafty Gentleman and The Makery to discuss the different ways that tape can give a new lease of life to items. “I’m really into DIY and crafts, so I use printed tape quite often – it’s such an easy way to add colour or pattern to a project. Aside from the obvious uses in gift wrapping, printed tape can be used in so many creative ways. For example, I’ve used it to make wall art, makeshift picture frames, greetings cards and loads more. My most recent DIY project with tape was a set of handmade drinks coasters. Get the full tutorial over on my blog at The Crafty Gentleman. You’ll be amazed at how easy they are to make! All you need is some printed sticky tape, plus a cork ring and some sealant or PVA glue (all of this is easy to find at any good craft shop). The great thing is that you can choose any colour/design of printed tape you want, so you can really personalise it to your home. 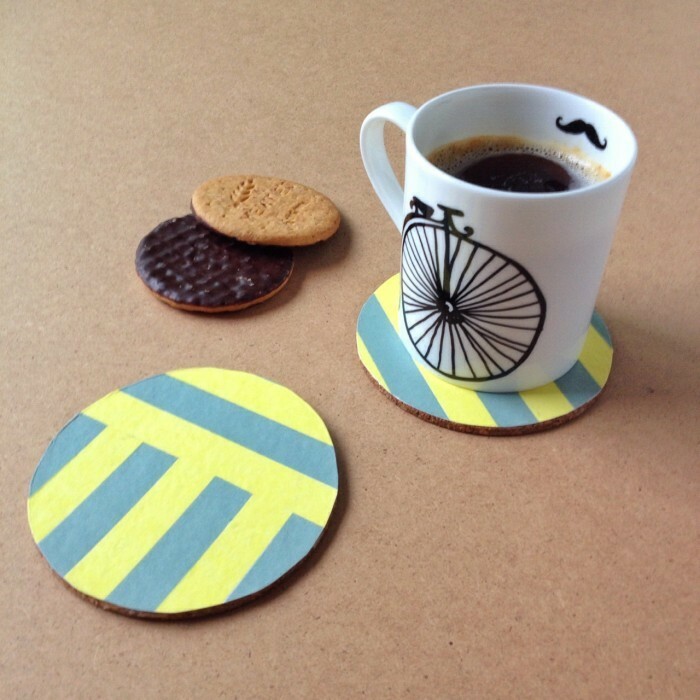 You can find out how to make the coasters for yourself here. The Makery Online Shop is a haven of creative delights, with an ever-expanding array of beautiful, carefully-sourced fabrics, craft kits and materials. You can pop into The Makery shop in Bath, or buy your craft supplies online. “Printed tape is a wonderful thing! We love it here at The Makery, and we use it all day long, whether that’s sealing up pretty packages, making handmade cards or just decorating everyday objects. 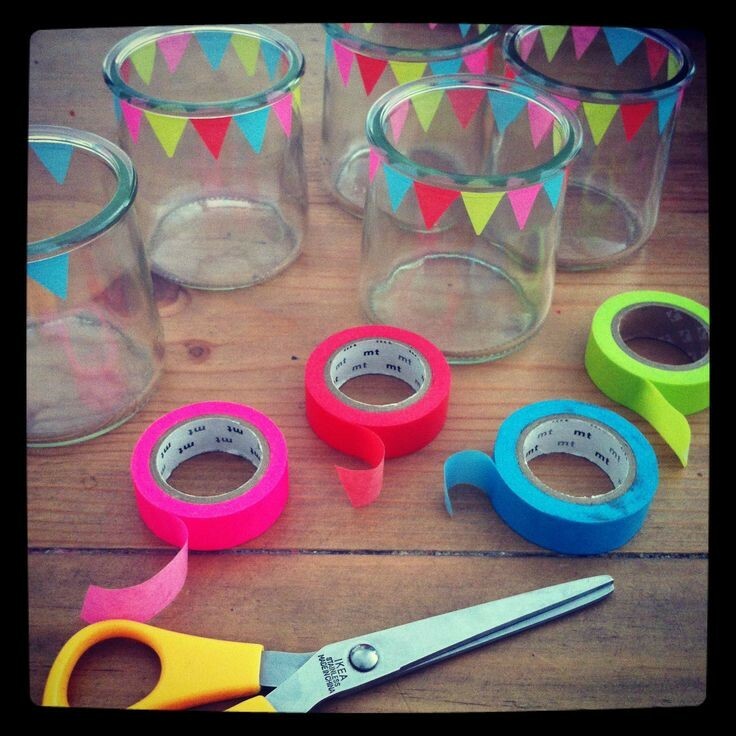 You can easily use coloured or patterned tape to decorate old jars. Just cut some neat strips from your tape and wrap carefully around your jars, horizontally or vertically, to make a stripy pattern. You can spell out names or words, and you could even experiment with cutting little triangles or zig zag patterns. 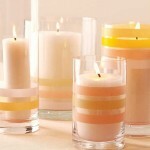 Try popping a tea light inside to illuminate your design! You can easily make mini bunting from any sort of sticky tape, you’ll just need a few different tapes and a little bit of string or twine. Cut out a diamond shape from your tape, and fold it in half around the twine by sticking it to itself. Then carry on making triangles until the bunting is your desired length. With custom printed tape you can decorate things with a whole range of messages or labels, from “Happy Birthday” to more practical labels such as “Pasta” or “Pens”. Building a spider’s web for your children is so easy to do and it encourages hours of fun. Simply find a doorway or adjoining walls and create wacky patterns by stretching your printed tape across the gap. Your children will love how their living room turns into a scene from a story book. Not only will this spruce up some plain old candle holders, but using different colours will result in some fantastic light effects. Similarly, with patterned printed tape, you can achieve some great shadow effects. There are many different reasons for customising items, from businesses looking to strengthen their brand message, to individuals giving their possessions a refreshing make-over. 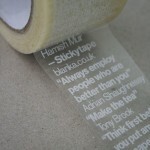 Printed tape offers a low cost, simple way for people to easily customise any item in many different ways. 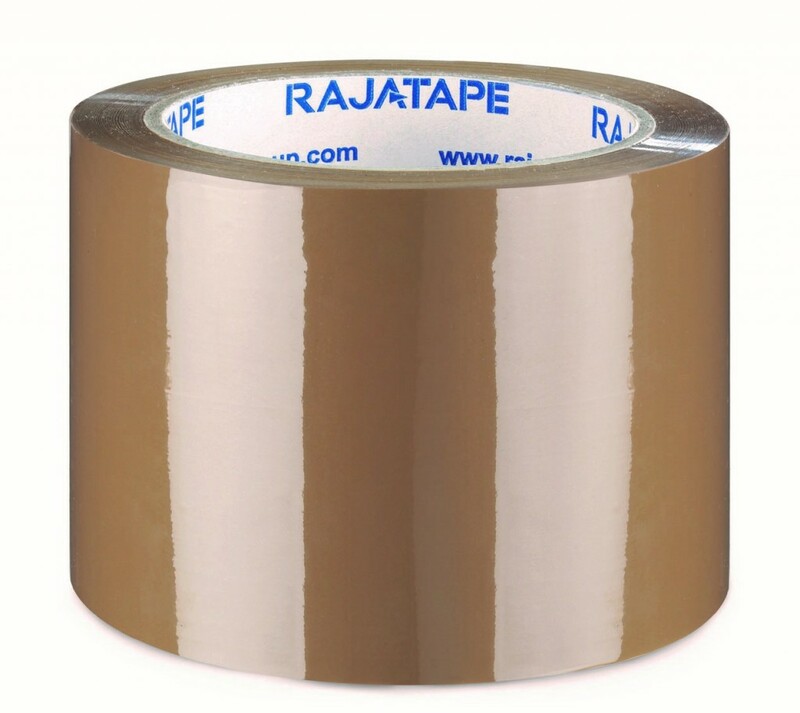 This entry was posted in Packaging Products & Materials and tagged creative, design, packaging, packaging tape, rajapack on July 27, 2015 by Rajapack. With wedding season upon us, many brides-to-be will be finalising seating arrangements and writing their vows. Getting married can be one of life’s most memorable experiences, especially when you add the extra glamour of doing it abroad. 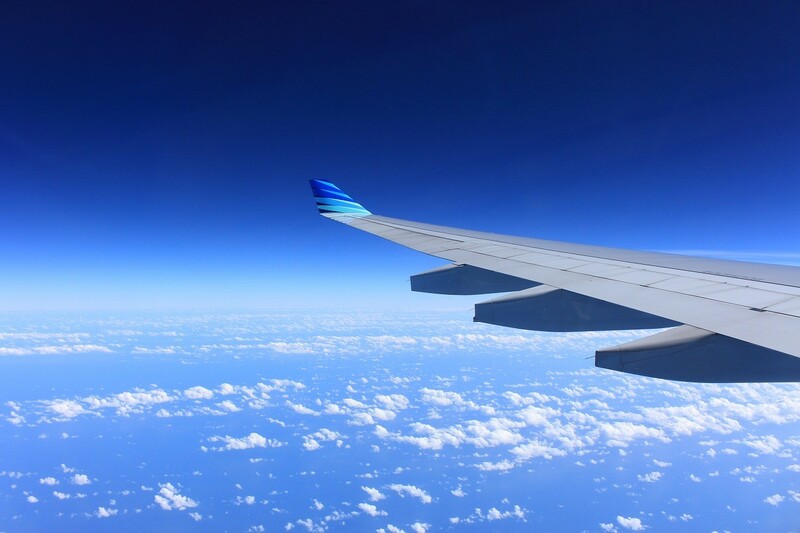 But for everything to go as planned, you need to think about how you are going to send your dress, clothes and cake to your destination, or get those precious keepsakes back home again afterwards. At Rajapack, we know a thing or two about packaging, so follow our advice and your cake, flowers and dresses will arrive at the venue in perfect condition. Transporting wedding goods to and from your destination can be tricky if you’re planning on saying “I do” with the sand between your toes. Despite any verbal or written agreement you might get from an airline prior to travel, there is no guarantee that they will accept anything in a garment bag, as it will exceed maximum carry-on dimensions. Ensure you have a suitable carry-on suitcase, ideally with a hard-shell case. Use the right packaging materials: use large sheets of white tissue paper to separate layers in the dress and to fold any suits. Our tissue paper is made from 100% pure wood pulp, is unglazed and acid-free to guarantee no damage to delicate fabrics. Wrap the whole garment in high quality bubble wrap. We use air-retention technology in our bubble wrap to ensure maximum protection. Top Tip: If you struggle to fit your dress into your suitcase, take it to a local wedding dress company who will be used to packing dresses. And if you can’t bring a steamer with you for your arrival, hang your dress up in the bathroom and blast the shower to steam up the room – this will naturally remove creases from the dress. If you have friends or family joining you for your wedding abroad it’s important to package their gifts safely and securely, especially when sending breakable and expensive wedding gifts in the post. With the right packaging products, your gifts will be able to withstand even the most heavy-handed of postmen. Wrap it up securely. Use our extra-cushioned bubble wrap and remember to secure it in place using masking tape. If you’re sending more than one item, it’s fine to use the same box, but wrap them up separately to avoid them knocking together. The box you use is really important, especially if you’re sending something big or heavy. Luckily, our toughest boxes can handle up to 500kg and are built to resist any kind of knocks or abrasions, thanks to the triple wall cardboard. Place your gift in the centre of the box and pack loose fill or rolled up kraft paper into any spaces to prevent it from moving around in transit. Seal up the box for extra security and add ‘Fragile’ tape around the parcel. Carefully consider the temperature to expect on your wedding day. Certain icings last longer at higher temperatures, so plan your cake around this. 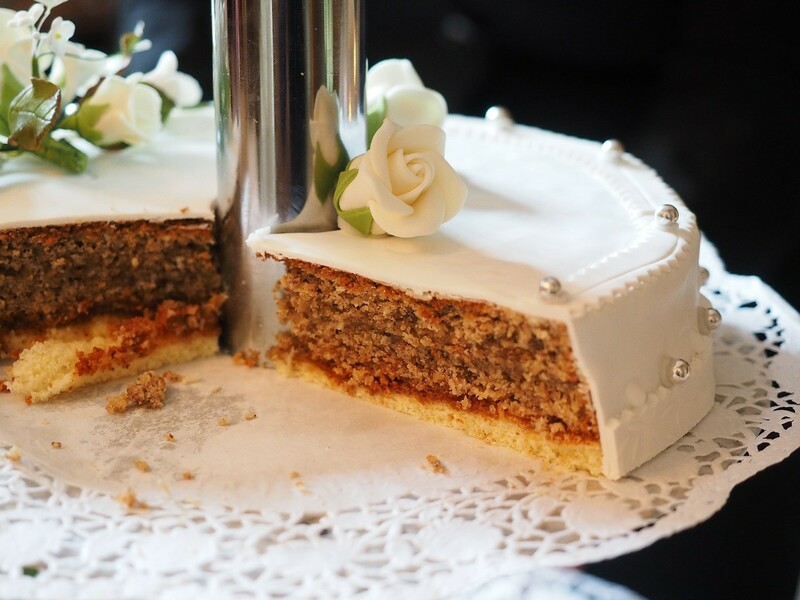 Before transporting a wedding cake, make sure it is set on a sturdy fibreboard or plywood base about ½ inch thick. Your cake shop should provide this or you can get your own from online suppliers. Remove any candles, toppers or decorations and if you have a tiered cake on pillars, it should be unassembled and each tier moved separately. A white box is generally used for a wedding cake, but standard cake boxes can prove flimsy, so opt for one of our double wall white boxes which come in a variety of sizes, for extra protection with a beautiful finish. Top Tip: If you’re hiring a courier to deliver your cake, your secret weapon is the ingenious Tiltwatch packaging label. You simply stick a Tiltwatch label to the inside of your package and when it arrives, if the label has turned red, you will know that the parcel has been tilted. With your wedding details planned, the extra spend on packaging and labels may seem unnecessary, but as Liz Coopersmith of Silver Charm Events says: “Many times, it’s worth it. It is better to have and not need, than it is to need and not have.” Carefully consider the intricate details of safe delivery and you can enjoy peace of mind on the day. Be sure that your wedding goods will arrive safely so all you need to do is get to the altar! This entry was posted in Packaging Products & Materials and tagged delivery, gifts, luxury packaging, packaging, rajapack, weddings, weddings abroad on July 15, 2015 by Rajapack.